The fast-casual segment is significantly outperforming all other restaurant segments. Sales at Top 500 fast-casual chains grew 8% in 2016, compared to just a 3.6% sales increase for Top 500 chains overall. And within the fast-casual segment, pizza is the star player, with sales up 49.3% in 2016. 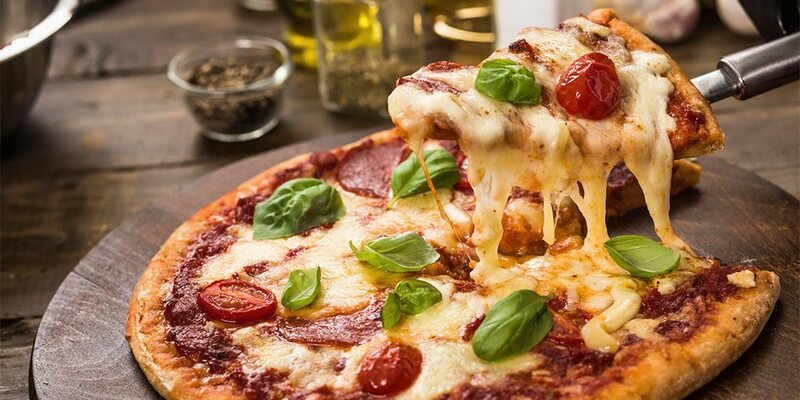 Thus, what’s happening in the fast-casual pizza segment is essential to understanding today’s consumer needs as well as general trends in the industry. Due to familiarity, craveability and broad appeal, pizza is one of the most consumed foods. And the recipe is so simple: crust topped with sauce, cheese and any toppings of one’s liking. Each of these components is essential in creating a good pizza. About four-fifths of consumers say cheese flavor (78%), crust texture (81%), sauce flavor/texture (82%) and other toppings (84%) are important. 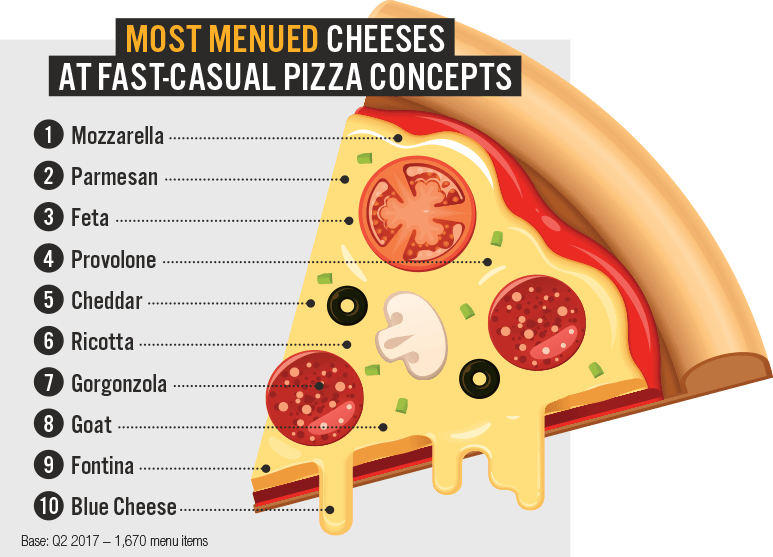 Not only does MOZZARELLA top the lists of most-menued and most-preferred cheeses at fast-casual pizza joints, but mentions are still growing. References of mozzarella are up 4.3% on fast-casual pizza menus in the last year. Nothing says pizza better than cheese. 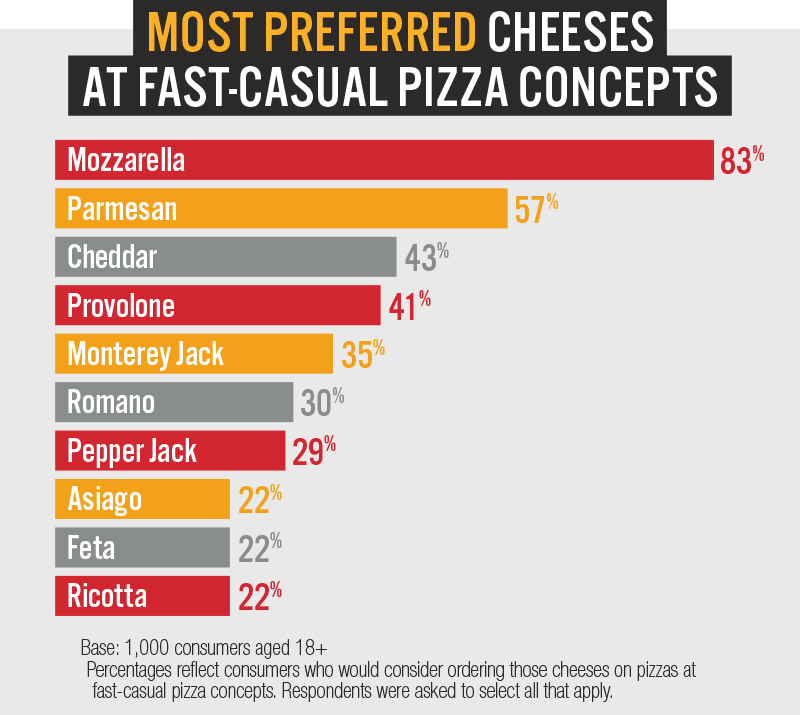 Mozzarella and Parmesan not only lead the list of top cheeses menued at fast-casual pizza concepts, but also are the two most preferred pizza cheeses by consumers at these concepts. Cheddar and provolone also rank in the top five lists. Both are firm cheeses with mild to sharp flavors and multiple flavor variations, such as smoked and herbed. The Jack cheeses—Monterey Jack and pepper jack—are not listed in the top 10 most-menued cheeses on fast-casual pizza menus. However, they are among the most preferred by consumers. Thus, operators can meet consumer demand by considering these versatile California cheeses on pizzas. Romano and Asiago’s a Go! The same situation as described above with the two jack cheeses is also the case with Romano and Asiago. These Italian-style sharp cheeses should also be in consideration to fill the menu gap. One of these is already on the rise: mentions of Romano at fast-casual pizza concepts are up 25% in the past year. Although a lot of fast-casual operators are spotlighting goat cheese on pizzas, it doesn’t rank in consumers’ top 10 most preferred cheeses. With only 14% of consumers saying they’d consider ordering a pizza topped with goat cheese, fast-casual operators might consider other cheeses before goat. 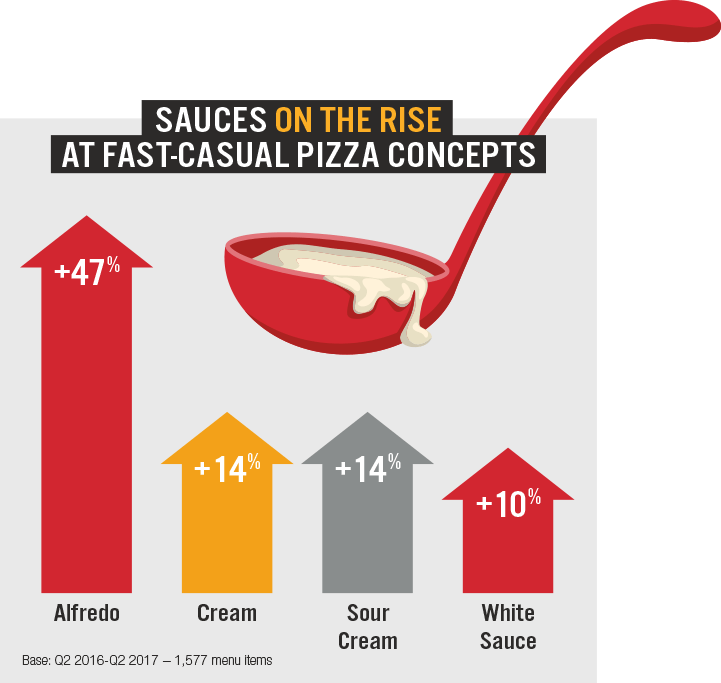 ALFREDO rounds out the top five sauces at fast-casual pizza concepts and WHITE SAUCE rounds out the top 10. Like cheese, sauce is also a focal point on pizzas. Thus, knowing consumers’ favorite pizza sauces and drizzles is essential for fast-casual pizza operators. Unsurprisingly, traditional tomato-based marinara sauce is the most preferred, as it’s also the most commonly menued sauce for pizzas in general. But perhaps more notably, the second on the list (percentages are rounded) is garlic Parmesan. This proves that while customers enjoy a classic, they also want to see a cheese they traditionally like atop their pizzas being applied to the sauce as well. 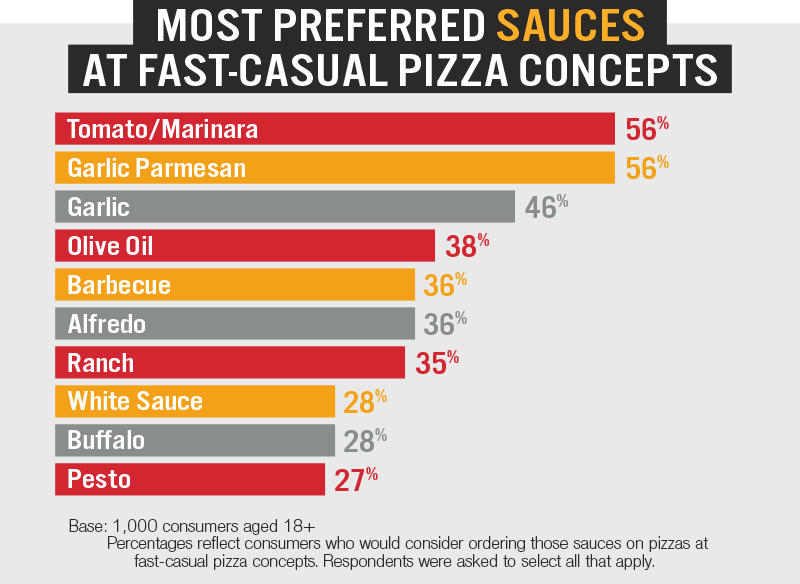 Many of consumers’ most preferred pizza sauces are also already growing on fast-casual pizza menus. For example, Alfredo mentions are up 47.4% on menus, and it ranks sixth on the most preferred list. It’s important to note that while five other sauces eclipse Alfredo in the overall consumer favorites list, 18- to 24-year-old consumers’ penchant for Alfredo is equal to that of tomato/marinara and garlic Parmesan. Exactly 48% of consumers aged 18-24 say that they’d consider ordering each of these three sauces. Menu and consumer data shed light on a number of trends within the fast-casual pizza segment. Here are five opportunities to consider. Almost three-quarters of consumers (73%) say they prefer a blend of cheeses on their pizza, swaying most heavily toward 45- to 54-year-olds (82%). Try combining cheese varieties that have opposing flavor profiles or mouthfeels to surprise diners. Pizza is already a comfort food favorite, but the trend can become a wow-factor mashup by incorporating other comfort foods as inspiration. Cheeseburger or loaded baked potato pizzas are some options to consider. Consumers who want an adventure without spending money on a plane ticket can get their kicks by trying a regionally inspired pizza. How about a Tex-Mex variation with queso or a pie topped with cheese curds? Some 38% of consumers want to see more dessert pizzas at fast-casual pizza concepts, leaning heavily toward Asians (56%) and 35- to 44-year-olds (55%). Operators should consider menuing pizzas with combinations like mascarpone with berries or Brie with honey, or drizzling melted butter on top for an extra indulgence. Daypart mashups are all the rage at restaurants, and breakfast pizzas are an innovative twist on the trend. Try creating an eggs Benedict-inspired breakfast pizza topped with hollandaise, or perhaps consider using breakfast cheese—a soft-ripened white cheese with a strong, aromatic flavor.